Police say they've arrested the man they believe punched a woman in the face after she confronted him about manspreading on the subway. Police have arrested a Brooklyn man they believe violently attacked a woman after she called him out for manspreading on a subway train. Derek Smith, 56, was arrested and charged with assault on Saturday, the NYPD said. The arrest comes just a couple of days after a Brooklyn woman posted a video that she says shows the manspreading attacker who punched her in the face during a profanity-laced tirade on a subway train Thursday morning. Sam Saia posted the video taken by another rider to her Facebook page Thursday night. She also posted a photo of her split lip. A Brooklyn woman said video shows the manspreading attacker who punched her in the face in during a profanity-laced tirade on a subway train Thursday morning. Rana Novini reports. Saia said she had gotten on the subway at Bay Parkway stop in Midwood and was riding to work when the man sitting next to her began manspreading, pushing her against the side of the car with his legs. Saia told him to relax and put her earbuds in. That’s when she said he slugged her in the face and banged her head against the wall of the train. “A bunch of good people ran to help me, as my lip was gushing blood,” she said on Facebook. One of the straphangers stepped in and subdued the alleged attacker. 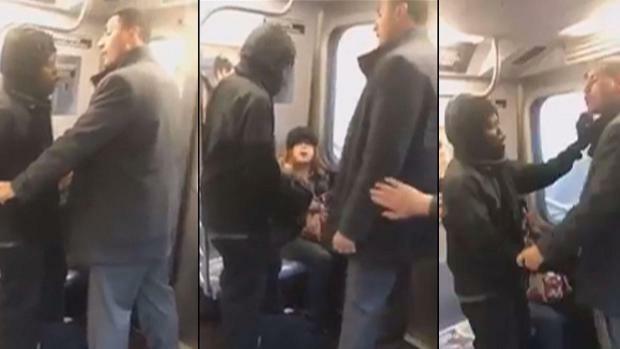 The video starts around this point; it shows the straphanger gripping the alleged attacker by his arms and ordering him to leave the train at the next subway stop. A Brooklyn woman posted a video to Facebook showing a man she says punched her in the face when she complained about his manspreading. (Warning: The video contains strong language). “Look at her mouth. Man, listen, look at her!” he says as he continues to clutch him by the arms. The video ends a short time later. Saia said she reported the incident to the police and was filing at a local precinct. Sam Saia posted a photo of her split lip to Facebook. She said she posted the video to social media to keep other people in the neighborhood safe. “Be warned. Stay safe!” she said.